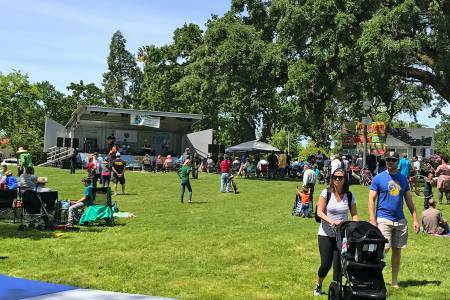 Stockton, California has something for everybody in April — from cultural events to food festivals, and celebrating Mother Earth. Spring has most certainly sprung here in Stockton, California, the region is gearing up for one of the busiest times of the year. Whether you are a local resident or a visitor here to enjoy our beautiful scenery, take a look at our handy guide to some of the best family-friendly events happening across the area in April. The Stockton Ports have been entertaining baseball fans at Banner Island Ballpark since the downtown playing field opened in April 2005. Hanging out with the Stockton Ports, whether it’s in the seats near the dugout or on a blanket on the grassy bluff areas, it's fun for the whole family! Plan an outing with family and friends by taking a glance at their April schedule. This cultural event boasts a variety of traditional Cambodian practices and spiritual activities at the Wat Dhammararam Buddhist Temple. The multi-day celebration focuses on buddhist ceremonies next to the larger than life statues, including food/merch vendors, traditional Khmer performances, and lively traditional dances. Learn more. One of the most anticipated events in Stockton, California can be found at the San Joaquin County Fairgrounds in April. The San Joaquin Asparagus Festival is considered the largest event celebrating the asparagus spear on the West Coast. The festival offers a weekend full of asparagus-related dishes, live musical acts, beer and wine garden, petting zoo, and an exhilarating carnival experience for children and the young at heart! Learn more. Considered as one of the largest Sikh parades in the entire state of California, this parade draws thousands of Sikhs from across the region. This vibrant procession makes its way toward Downtown Stockton every year, then reverts to the Sikh Temple for an array of cultural activities. The festivities include authentic cuisine, sporting events, traditional garb, turbans, and ceremonial attire of Sikhism, and its history. Learn more. Originating in 1988, the Stockton Earth Day Festival is an opportunity to reflect how to make our Earth a better place for everyone. Celebrate the planet and revel with eco-friendly festival goers at this one-day event at Victory Park. Festivities include an early yoga session, a march for science, unique efforts to protect the Planet Earth, presentations of creative arts and science projects by local students, and live musical performances. Learn more. Launched in the spring of 2015, with a mission to support local artists and entrepreneurs, the Stockmarket is now located next to the Historic Waterfront Warehouse at the Downtown Stockton Marina. This markers' market combines the best in local emerging artists, crafters, and designers, alongside artisan food, gourmet food trucks and an array of live musical performances. Learn more. Need more recommendations? You can message us 7 days a week for assistance on shopping, dining, and things to do in Stockton. Follow us on Facebook, Twitter, and Instagram - and be sure to use #VisitStockton during your visit!